Home to Three Generations and a Founding Father. Welcome to the Charles Carroll House and Garden in Annapolis! The seat of the Catholic Carrolls of Annapolis, the Charles Carroll House was the primary urban residence of its most famous owner, Charles Carroll of Carrollton. 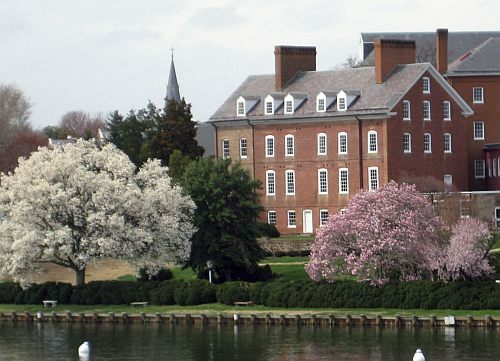 Today, the property, on the grounds of St. Mary’s Roman Catholic Church, is among the largest and most impressive historic sites in Annapolis. It is owned by the Congregation of the Most Holy Redeemer (Redemptorists), a Roman Catholic congregation of priests and brothers. Celebrating a history that spans over 300 years, the Carroll House is a restoration-in-progress. The site bears great historical significance to the state of Maryland and America as the home of Charles Carroll the Settler, first Attorney General of Maryland, his son, Charles Carroll of Annapolis and his grandson, Charles Carroll of Carrollton (1737-1832). Faced with both persecution and restrictions for his faith, Charles Carroll of Carrollton secured his family’s vision of personal, political and religious freedom for all citizens when he became the only Catholic to sign the Declaration of Independence in 1776. The Carroll House is one of only fifteen surviving signer’s birthplaces in the United States. As the home of the only Catholic signer, the Carroll House also bears great historical significance to the Catholic Church in Maryland and America. The Carrolls were among the most prominent Catholics in the English colonies and the early United States. One cousin, John Carroll, was the first Catholic bishop in the United States, having been named first Bishop of Baltimore in 1789. The property’s Catholic connections were renewed in 1852 when it was conveyed to the Redemptorists who used it as their novitiate. Today the Carroll House is open to the public for tours on Saturdays and Sundays from early June through late September. It is available by appointment for group tours year-round. The House hosts various public events throughout the year and is available to rent for private events.